We get it—it can be tricky to find a pair of figure-flattering boyfriend jeans. If you’re either tapped out with hunting down the perfect pair, or don’t love their uber-relaxed fit it’s only natural to find another denim soulmate. Here are two denim swaps to make for boyfriend jeans! This feminine version of the boyfriend is just that: more feminine. Girlfriend jeans are cut to sit higher on the hips and have a slim straight leg fit. Designed to hug your curves, the girlfriend style will emulate the boyfriend style but still show off your shape. Enhance the femme-fatale factor with a floral blouse loosely tucked in and a fab pair of pumps, or go business casual with a printed shell, a structured blazer and flats. 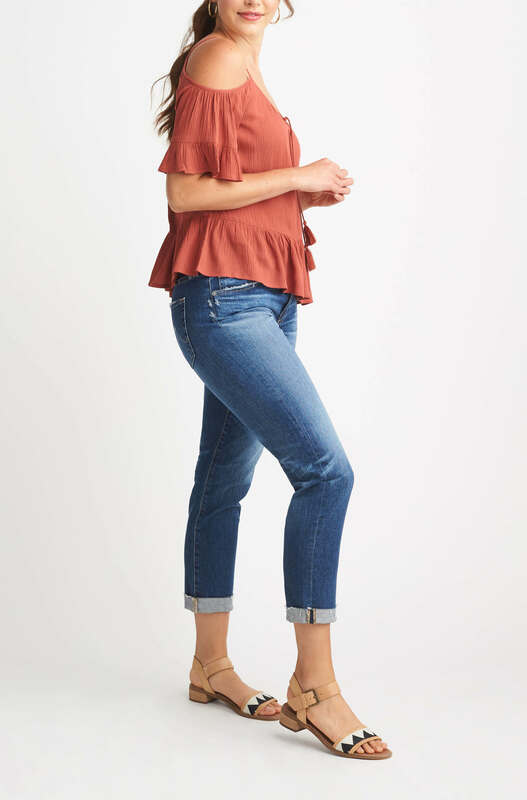 The versatile straight leg jean fits right in between a boyfriend and girlfriend style—plus a figure-flattering cut that works for almost any body type. Wear them long for a more tailored feel or cuff just above the ankle to get that boyfriend-esque look without the loose fit. Go preppy chic with your cuffed straight leg jeans and pair with a striped tee. Add an on-trend canvas sneaker in a vibrant color and finish with a crossbody bag for an effortless casual style. With these two alternatives, you’re destined to meet your denim match! Wondering what other denim you can swap in? Go ahead and ask a Stylist!